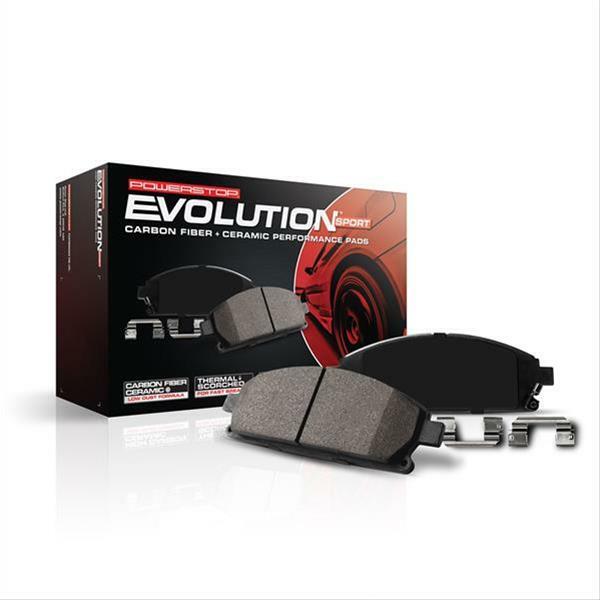 Power Stop Z23 Evolution Sport carbon fiber infused ceramic brake pads are designed for enthusiasts who want to get the most out of their vehicle without sacrificing everyday drivability. Evolutions resist fade up to much higher temperatures than OEM pads. Their carbon fiber-infused ceramic formula provides superior strength. They are thermal scorched for a fast break-in, chamfered and slotted like the OEM brake pads, and working with premium rubber shims they ensure virtually noise-free braking. These brake pads use a powdercoated backing plate that extends life by resisting rust and corrosion. And the pads include a ceramic-based high-temperature lubricant specially-formulated to work with the Z23 Evolution pads.